So, now I have found out about Modern Quilting and I want to do some of that. I pull out my trusty 45 year old sewing machine that was the “cat’s meow” back then but looks and runs a little poorly now and I look for some neat quilt patterns online. I found a neat Friendship Star that I thought I could make look modern with some great prints. Sandi Walton’s web site has some free patterns. 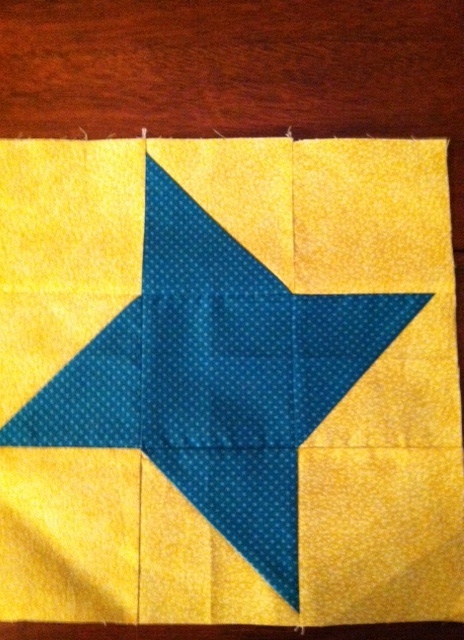 Look under patterns and the friendship star is right there. Thanks Sandi for the free patterns and directions. I didn’t want to spend too much money on fabric while learning. So, I went to my local big box store and bought an assortment of bright small prints. Then, I looked online to see if I should preshrink my fabrics. Well, that was an eye opener. After reading many great instructions on preshrinking or not, I decided that my fabric was not the better quality of the quilt shops and preshrunk the whole batch. Now to the quarter inch seams! 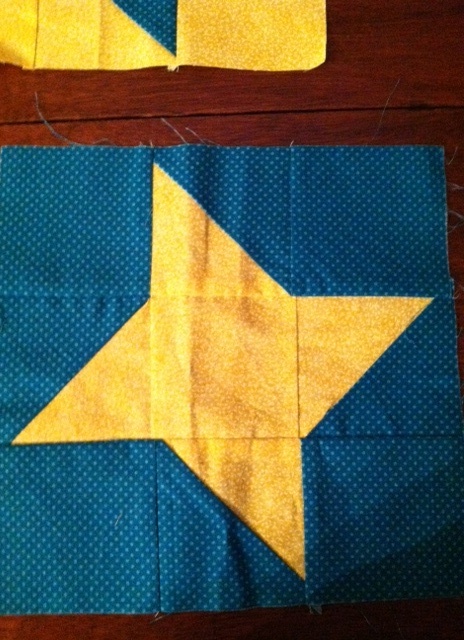 I never knew how a seam could effect a small quilt block. This is a picture of my first try. Well, there is supposed to be a quarter inch at the end of every point of this star and the little squares are supposed to match at the corners. I really messed this up. So, I went to my wonderful quilt shop near my home and got some feedback from the owner. She said it was…can you guess? Yes, you are right, the seams were not a quarter of an inch. She also told me to be sure to measure my little squares exactly with my ruler. So, back home I went. It’s pretty lame, too, as my daughter would say. 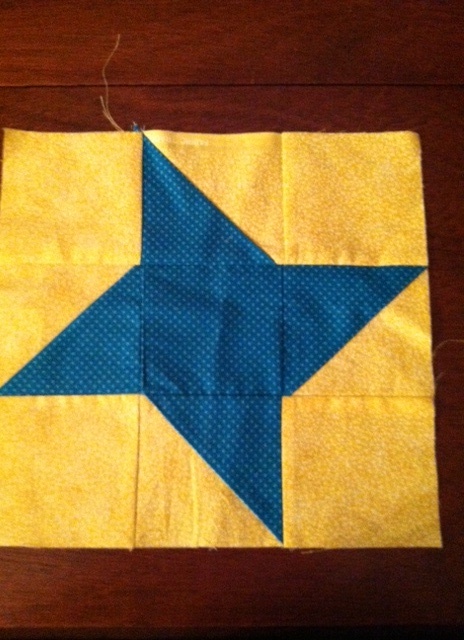 The corners of the squares still didn’t match and the points of the star were not in the right place. I was beginning to get frustrated. Well, I began to try again and this is what I did. Hallelujah! Three of the points end with quarter inch seams. And, best of all, the little squares meet correctly at the corners. Now, I only had a bazillion more to make. I have a good friend who did counted cross stitch while raising four children. She said it was therapeutic. Well, I am not trying to discourage all of you who want to make those beautiful quilts with the small squares and matched corners and points that end where? … a quarter inch from the side of the block, but I’m a little too ADD at this time for that. So, I went back to the drawing board. Tune in next time to see what I did. This entry was posted in Uncategorized and tagged Beginning quilting, free quilt patterns, Modern Quilting, quarter inch seams, Quilting. Bookmark the permalink.